Occupancy from 9 AM to 5:30 PM. Located at a distance of 16 km from Hyderabad, Nehru Zoological Park was opened to the public in the year of 1963. It is situated near the historically important Mir Alam Tank, which is 200 year old and is the first multi-arch masonry dam in the world. Nehru Zoological Park is one of the largest zoos of India and one of the top sightseeing places to visit in Hyderabad. Run by the Forest department, Government of Telangana, the zoo has been named after Jawaharlal Nehru, the first prime minister of the country. Spread over an area of approximately 380 acres, the Nehru Zoo Park boasts of almost 1,500 species of birds, mammals and reptiles. Adding to the extensive varieties of wildlife, this zoo park is considered to be the first one where animals have been kept in zoological order. What makes Hyderabad zoo an amiable place for both visitors and inhabitants are the open enclosures in which animals are kept. These open enclosures have been created to resemble the natural habitats. A wide variety of exotic animals have been successfully bred in this zoo park as well. 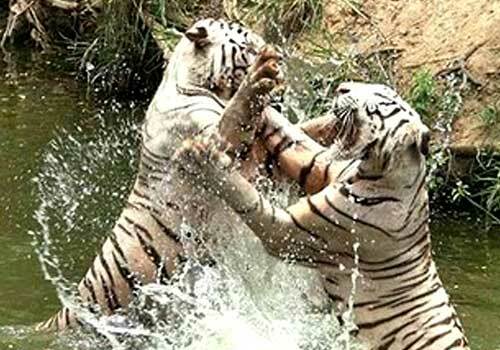 Adding to the overall experience are the extensive range of activities to do in Hyderabad Zoo Park. Various Safaris, such as lion safari, bear safari and bison safari, along with toy train makes the visit all the more exciting. Butterfly Park, Jurassic Park, aquariums, etc., also let you explore the wildlife in a fun yet educational manner. Nehru Zoological Park was established in the year 1959 while it was opened to the public on 6th October 1963. There has been many changes and additions since the conceptualization of the zoo park. For instance, in the year 1974, Lion Safari Park was started and the Nocturnal Animal House was established in 1982. 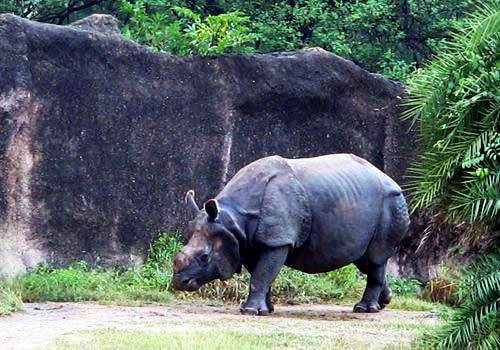 Nehru zoological park Hyderabad was established with the objective of conserving and breeding of endangered species, specially the wild life of Deccan Plateau as well as rehabilitating them. Other objectives of establishing the Hyderabad zoo was to educate the public about wildlife and generate awareness and to facilitate researches on animal behaviour, their rehabilitation and breeding patterns. Nehru zoological park Hyderabad boasts of a rich variety of wildlife. There are more than 140 species of animals, birds and mammals in the zoo park. Mir Alam tank attracts migratory birds from all over the world also wild life enthusiasts. Following are some of the fauna species that can be found at the zoo. Avian Fauna- owls, pelicans, herons, vultures, storks, parrots, egrets, macaws, cranes, hornbills, eagles, cocktails, parakeets, ducks, love birds, pheasants, geese, lories. Reptiles- Crocodiles such as marsh Crocodile, gharial, and salt water Crocodile, chaimen. Snakes such as king cobra, python, cobra, Russell's viper, sand boa, rat snake, green vine snake. Lizards such as monitor lizards, chameleon, green Laguna. Tortoise such as start tortoise, turtles, Indian softshell turtle, melanochelys turtle, red ear turtle. Mammals- primates, herbivores, carnivores, omnivore and rodents. All kinds of species here. Indian rhinoceros, Asiatic lion, Bengal tiger, panther, gaur, Indian elephant, sambar deer, fishing cat, leopard cat, hyena, wolf, wild dog, fox, cheetah, jaguar, sloth bear, black bear, sun bear, wild boar, civets, swamp deer, hog deer, nilgai/ blue bull, blackbuck, giraffe, hippopotamus, chousingha, mouse deer, thamin deer, spotted deer, barking deer, hog deer, rodents like porcupines and giant squirrel; sacred baboon, red patas monkey, chimpanzee, lion tail macaque, bonnet macaque, rhesus macaque, olive baboon, common langur, nilgiri langur. Zoo Park provides various facilities for the convenience of the visitors, making the visit even more pleasurable. Some of the facilities that are offered include safe drinking water, first aid facility, toilets and washrooms, battery operated vehicles, separate parking area, along with benches and other shelters for rest that have been strategically placed throughout the park. For those who would like to spend entire day at the zoo, there is accommodation facility as well. The Zoo Guest house is available for rent from 9 AM to 5.50 PM. The charges are Rs.500 for a group of 10 people. There is a food court with multi-cuisine choices at the park along with two canteens namely, Rhino canteen which is near the Rhino enclosure and Maharaja Canteen which is located near the parrot World, offering snacks, beverages, bakery items, etc. Vijaya dairy, exclusively selling dairy product is also located inside the Nehru zoological park. At Nehru Zoo Park, visitors will find umpteen numbers of things to do. A popular picnic spot for the twin cities, Hyderabad and Secunderabad, the zoo park offers a wide variety of entertaining choices. Tiger & Lion Safari- Safaris are the main attraction amongst visitors at Zoo Park. One can choose from Bison Safari, Lion Safari, Tiger Safari and Bear Safari. The ticket price for safaris is Rs.40 for adults and Rs.20 for children below 12 years of age. The safaris run at regular intervals throughout the day, presenting a perfect way to get a view of the various wild animals such as lions, sloth bears, deer, tigers, etc. The charges for safari rides are Rs.20 for kids and Rs.40 per person for adults. Please be aware that sometimes almost an hour goes into waiting for your turn in the Queue. If you are travelling with kids, it's suggested to carry refreshments along. 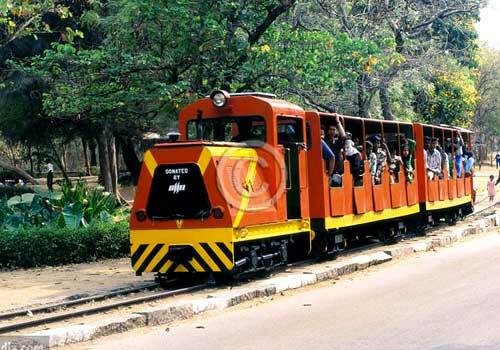 Toy Train- The toy train is Zoo park’s another significant part of a visit to the Hyderabad zoo. It is especially popular among kids. The fee for train ride is Rs.5 for children below 12 years of age. For adults the fee is Rs.15 per person. Also during non-peak time the train would not move until it is full. It might take 30 mins or even more. Unlike Buggy ride, where they will stop at popular spots and let you spend some time, toy train doesn’t stop anywhere. Bicycle Rides- Another fun activity to do at the Zoo Park in Hyderabad is to go for a ride on bicycle. Bicycles are available at the park for a minimal rent of Rs.20 per hour. Buggy / Battery Operated Vehicles- Battery operated vehicles, which are environment friendly and noiseless are also available, offering a hassle-free tour of Zoo Park. Tourists can enjoy a comfortable ride of the park with Buggy / Pram while exploring its rich flora and fauna. The charges for buggy ride is Rs.50 for adults and Rs.30 for kids. The buggy ride goes on for about 30 mins to 1 hr. A concession in the ticket price is also offered for school kids. Buggy ride is the best option for people who cannot walk for long, yet wish to cover important places of the zoo. Boating- Boating at the Mir Alam Lake is another attraction of the Nehru zoological park. The boating is organized by the TSTDC. In Addition to passenger boats, speed boats are also available at the lake. Children’s Park- There is a separate children’s park at the Hyderabad zoo with multiple choices to enjoyably engage kids. Jurassic Park- Another attraction for kids is the Jurassic Park, which boasts of life-size figures of various dinosaurs species such as Brontosaurus, Triceratops, Stegosaurus, and Tyrannosaurus. Information on each of the species is also provided at the park. Butterfly Park- Established in 1988, Butterfly Park presents an innumerable varieties of butterflies that can be spotted throughout the year. Nehru zoological park Hyderabad is the first zoo in the country to start a park solely dedicated to butterflies. Weekly educational events- The authorities are also putting efforts in creating awareness about the wild life among masses. Weekly educational classes and awareness events are being conducted frequently. Some of the programs that are conducted at the park are Tiger talk (Tuesday), elephant talk (Wednesday), canine classes (Thursday), bird school (Friday), crocodile coaching (Saturday) and snake awareness shows (Sunday). Aquarium- A number of aquatic species, freshwater as well as marine water species, can be seen in the huge Aquarium at the park. Exotic fish and their colorful features attract every visitor. Museum- Museum is another section that must be visited while on your tour of the zoo park in Hyderabad. It consists of various exhibitions on biodiversity conservation, panel boards with interactive calls of different animals, evidences of animals such as their pug mark, feathers, etc. along with Taxidermy models of various animals. The nocturnal house- At this part of Nehru zoological park, the night and day cycle have been artificially reversed so as to create an environment for nocturnal animals such as bats, loris, civets, owls, cats, etc., to be active during the visiting hours. The entry fee at the nocturnal house is Rs.5 for children below 12 years and Rs.10 for adults. Zoological Park Hyderabad offers various facilities so to ensure a hassle free visit as well as maintenance of suitable environment for wildlife. Plastic free zone- Hyderabad zoo is a plastic free zone. Hence, the visitors are not allowed to take any plastic bag or any other related items inside the zoo premises. If in case a visitor is carrying any plastic covers or packets, he or she is required to submit them to the security personnel at the entrance gate. Security Maintenance- Nehru Zoo Park prides in up-to-date security system. To safeguard the protected area and the endangered species, trained security personnel have been stationed all over the park. More than 35 security guards protect the vicinity of the park. There is also facility of fire-safety which is ensured by the trained zoo staff. Lost and Found- The security personnel at the park also assist in finding out any item that have been lost by the visitor within the zoo premises. 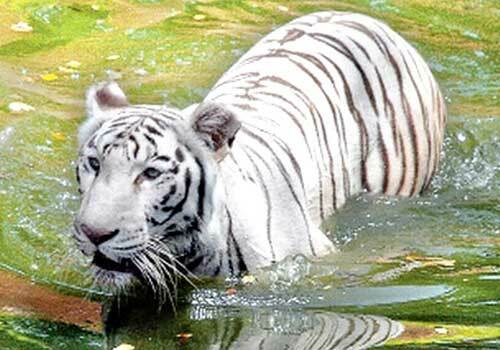 Nehru zoological park Hyderabad timings are from 8 AM to 5.30 PM during the months of April to June while from the month of July to March, the zoo park timings are from 8.30 AM to 5 PM. The booking of tickets closes at 4.30 PM. Hyderabad Zoo Park is open on all days of the week, except on Mondays. Nehru zoological park entry fee is Rs.15 for children below 12 years of age while for adults it is Rs.30. The trucks for shooting are allowed inside at the charge of Rs.1500. The Camera fee at Zoo Park Hyderabad is Rs.20 for still camera and Amateur video camera. While for professional still or video camera, the fee is Rs.500. Along with this, for a film shooting, the charges are Rs.8500 per day, in addition to Rs.1500 for generator. 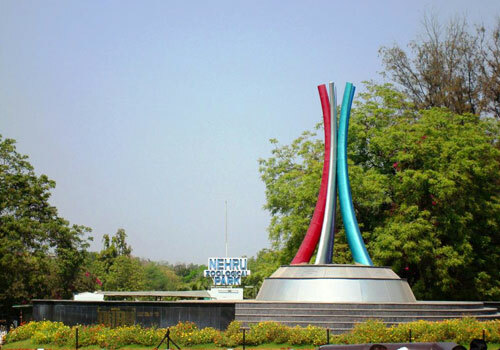 Nehru Zoological Park is located on the Zoo Main road. It lies near the Kishan Bagh in Bahadurpura. The park is near the Mir Alam Tank, which is well known to the local residents, hence reaching the park is not a difficult task. If travelling by public transport, the best way is to travel by Hyderabad City Bus directly to Zoo or MMTS to the Hyderabad Deccan Railway Station, which is also known as Nampally railway station. It is around 5 km away from the zoo park. How to reach Nehru Zoo Park Hyderabad by city bus / public transport? The best way to reach the zoo park is through City Bus or MMTS. Tourists can take the train to the nearest MMTS station which is Nampally railway station, from where they can either take a taxi or hire an auto rickshaw. Nehru Zoo Park can also be reached by city bus. There are regular buses from Secunderabad Junction to Zoo Park such as 1Z, 7Z and 8Z. If you are travelling from Mahatma Gandhi Bus Station, which is also known as Hyderabad main Bus station and central bus station, then you can board any of the following buses: 1Z, 2Z 7Z, 94, 94K, 94R, 94U, 95A, 95L, 95M, 95P and 95R, to reach Zoo park. For those travelling from Nampally railway station or Jubilee Bus Station to zoo park, they are required to get down at Afzalgunj, which is only 2.2 km from the park. There are regular buses from Afzalgunj to the park such as 1Z, 7Z, 8Z, 94K, 94R, 94U, 95A and many more. How to reach Nehru Zoo Park from Banjara Hills? 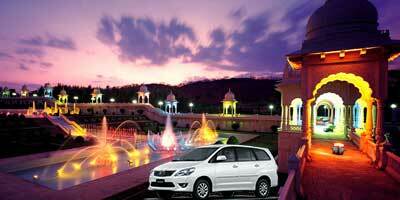 Banjara Hills is located around 20 km away from Nehru Zoological Park. One can reach the zoo park within 40 minutes of time via road, either by bus or taxi or a private car. However, there are no direct bus route from Banjara hills to Zoo Park. You can take a bus from Banjara Hills to Nampally and then take a bus from Nampally to Zoo Park. Which is the nearest MMTS station? The nearest MMTS station to Nehru Zoological Park is Nampally railway station which is around 4.5 km away. Currently there are no A/C city buses plying to Nehru Zoo Park from any place in Hyderabad. Check here for complete list / routes of AC City buses plying in Hyderabad. How to reach Nehru Zoological Park Hyderabad from Dilsukhnagar? 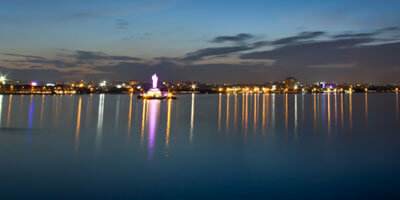 Dilsukhnagar is located around 11 km away from Nehru Zoo Park. One can reach the zoo park within 35 minutes by road. Tourists can use either buses or private vehicles like cars to reach Zoo Park. There are a few buses that run from Dilsukhnagar Bus station and go via Zoo Park such as 252D, 94, etc. One can also catch bus to MG Bus stand and from there to Zoo Park. How to reach Zoo Park from Afzalgunj Bus Station? How to reach Zoo Park from Koti Bus Station? How to reach Zoo Park from Nampally Hyderabad Railway Station? 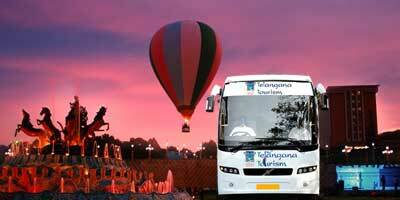 One could take a direct bus from Nampally to Zoo Park, Route no: 8R/Z or Nampally to Zoo Park Via Afzalgunj Bus Stop. How to reach Zoo Park from Kachiguda Railway Station? One could take a direct bus from Kachiguda Railway Station to Zoo Park, Route no: 3Z or Kacheguda to Zoo Park Via Afzalgunj Bus Stop. How to reach Zoo Park from Secunderabad Railway Station? To reach from Secunderabad railway station to Zoo Park, catch the following direct Hyderabad city buses with route no: 1Z, 7Z or 8Z or Secunderabad to Zoo Park Via Afzalgunj Bus Stop. How to reach Zoo Park from Mehdipatnam? One could take a direct bus from Mehdipatnam to Zoo Park, Route no: 65Z or Mehdipatnam to Zoo Park Via Afzalgunj Bus Stop. How to reach Zoo Park from Ameerpet? One could take a direct bus from Ameerpet to Zoo Park, Route no: 251A or Ameerpet to Zoo Park Via Afzalgunj Bus Stop. I.T exemption under Section 80 G (2) & (5) of IT Act 1961. Preferential allotment for Guest house reservation. Most important thing is that you can have the great feeling that you are practically participating in the conservation of our rich heritage. 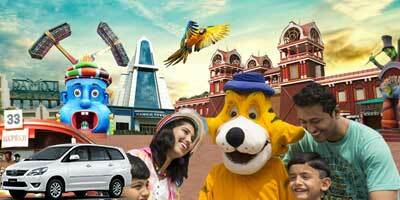 You & Your Company can also reach out to Lakhs of visitors of the zoo. through the plaque kept near the enclosure displaying your company Logo and Name. You will be allowed to view the animals from the close quarters of the animal enclosure / animals / birds you have adopted. Are there any special facilities for senior citizens or physically challenged at Nehru Zoo Park Hyderabad? The battery operated vehicles for getting around the park along with benches and shelters to take rest, make it convenient for senior citizens to visit the zoo park. How to travel inside the Nehru Zoological Park Hyderabad? Own / private cars allowed inside? For commuting inside the Hyderabad Zoo park, there are battery operated vehicles as well as bicycles. Hyderabad Zoo has allowed private vehicles inside for some time for a separate entry fee, but then they stopped it. Kindly check with the Zoo management to check current status. What is there to see in Nehru Zoological Park Hyderabad? There are many things to see at Zoo park in Hyderabad such as spotting wildlife on Safari tour, museum, aquarium, Butterfly Park, Jurassic Park, Children’s Park, Nocturnal animal house , etc. When is the best time / season to visit Nehru Zoological Park? One can visit zoo park Hyderabad at any time of the year. However when the weather is pleasant for outdoor activities such as during winter, is best time to plan your visit. Outside food is allowed within the premises if wrapped in paper or in paper bags. Plastic bottles and plastic bags or polyethene covers are not allowed inside the zoo. Is baby food allowed inside Nehru Zoo Park Hyderabad? Yes, visitors are allowed to take baby food inside, provided it is not packed in any of the plastic item. Is it good to travel with infants or kids below 2 yrs to Nehru Zoological Park Hyderabad? Nehru Zoological Park Hyderabad presents a rich environment for learning and spotting wildlife. The activities offered at the park are also for adults and children who can understand the importance of conserving the nature and its fauna. Hence, it is not an ideal place to take infants or kids below 2 year of age. Is there a parking facility at Nehru Zoo Park Hyderabad and what are the parking charges? Yes, parking facility for two and four wheelers is available at the zoo park. Is there any cloak room facility at Nehru Zoological Park Hyderabad? Yes, there is facility for cloak room at Zoo Park. But you may only be allowed to store small baggages like backpack. Large size luggage items may not be allowed. Is one day enough to cover Nehru Zoological Park Hyderabad? Yes one entire day is enough for exploring the Nehru Park. However, if you wish to explore everything at ease, especially if you are travelling with kids then plan a two day trip to the Park, so that you have enough time at hand for various activities such as boating, safari and bicycling. Kids can also spend more time at the various entertaining options which have been created for them. Are there any budget hotels or lodges around Nehru Zoo Park Hyderabad at affordable cost? Yes there are few budget hotels and lodges available around Nehru Zoo park, but it's recommend to choose a hotel near nampally which is in city center and 5 kms away from Zoo park. You will find more hotels here at decent price..
Is it recommended to hire a guide to visit Nehru Zoological Park Hyderabad? If its school tour or even if it's with family,a tour guide will help you understand the importance of conserving the nature and its fauna and understand various species of animals & birds. What are the Lion & Tiger Safari timings? Nehru Zoo Park Tiger & Lion safari timings are from 9 AM to 4:30 PM. Bus frequency is good, there will be a safari bus leaving every 10 mins. 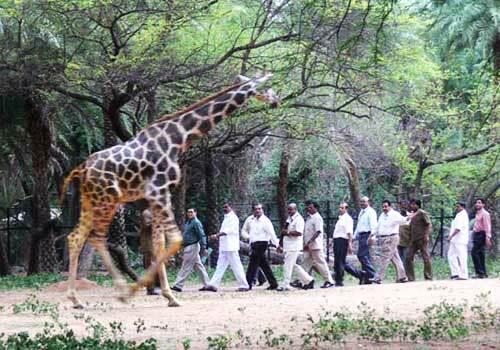 How much walking is required at Nehru Zoological Park Hyderabad? Any alternate options? A lot. Be prepared to walk for long distances. You might be required to walk around 4 to 8 kms. However there are battery operated vehicles as well as bicycles available at the Hyderabad zoo park for those who prefer not to walk that long. What not to miss during Nehru Zoological Park Hyderabad visit? 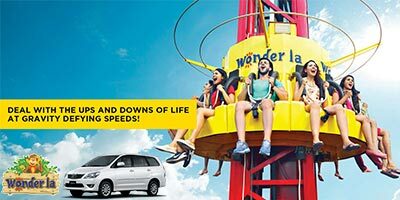 On your visit to zoo park Hyderabad, do not miss a ride for Lion & Tiger safaris. Boating is also an experience worth trying. If travelling with kids, ensure a ride on the toy train. What are the food options available at Nehru Zoo Park Hyderabad? Ample of food choices are offered at the zoological park such as multi-cuisine food court; Rhino canteen and Maharaja canteens for snacks and beverages and a separate Vijaya dairy for all kinds of dairy products. What is inside Nehru Zoological Park Hyderabad? Inside the Nehru Zoological Park Hyderabad, an extensive variety of wildlife (avian fauna, Mammals, reptiles) can be see through various safaris. Along with this, there is a museum, nocturnal house and aquarium. For kids, there is a children’s park, Jurassic Park, Butterfly Park. Toy train rides and boating is also an interesting part of zoo park visit. What is the area of Hyderabad Zoo Park? Hyderabad Zoo Park is spread across 380 acres of land. Where is Nehru Zoological Park in Hyderabad? Nehru Zoological Park is located in Bahadurpura, on the Zoo Park Main Road. It is situated near the Kishan Bagh. There are multiple public transportation options to reach Hyderabad Zoo. What is Nehru Zoological Park Hyderabad timings on Saturday and Sunday? Nehru Zoological Park Hyderabad timings on Saturday and Sunday are from 8 AM to 5.30 PM during the months of April to June. From July to March, the Nehru zoological park timing is from 8.30 AM to 5 PM. What is the Camera fee at Hyderabad Zoo Park? The Hyderabad zoo park fee for still camera is Rs.20 while for professional still cameras it is Rs.500 per day. The camera fee for basic video camera is Rs.100, while for professional camera it is Rs.500. Is Nehru Zoological Park Hyderabad open on all public holidays? Yes, Nehru Zoological Park Hyderabad remains open on public holidays, unless it's Monday which is a holiday. Does Nehru Zoological Park Hyderabad accept credit cards at the booking counter? Only cash is accepted for booking tickets at the Hyderabad Zoo Park as of date. When is Hyderabad Zoo closed? Hyderabad Zoo is closed on Monday. Zoo park timings are from 8.30 AM to 5 PM every day in July to March and from 8 AM to 5.30 PM in the months of April to June. Is there any Online booking facility? There are no facility for booking Nehru zoological park online tickets at the moment. One can purchase the entry tickets from the Zoo booking counter at the entrance. When is the weekly off for Hyderabad Zoo? Hyderabad Zoo is closed on every Monday of the week. We went from Koti, there is direct bus from Koti to Bahadurpura, from there we went to Nehru zoological park. There is a toy train, although there was no kid with us we went and sat, it was fun! It covers most of the area where you see different kinds of birds and animals. It closes early in evening. Its timings are till 5 pm, they even stop selling the entry ticket to Nehru zoo park by 4.30 pm itself. So better to go early, see this place at leisure and then come home by night. It is a good place for weekend. There are buses from Koti to bahadurpura too but we went in our car, four of us. We started very early in morning, had bf on the way and then reached there. Timings of Nehru zoological park is from 8.30 to 5.30 pm. As it closes also early better to reach there as early as you can. It was so big that we took entire day to see it, was only possible because we went early. Nehru zoo park of Hyderabad is one of the largest zoo, there are many varieties of animals, birds and even flora. There is safari inside, even toy train which takes you around the park. There was a cafeteria and restaurant for food too, but better to take your own food! The entry ticket for Nehru zoo park is very less, it was only Rs 20 per person for adults and for kids rs.10 per person. There are buses from koti to here so even travelling is not expensive. I have gone to Nehru zoological park of Hyderabad many times, it used to be awesome, one of the best zoos in the country. Recently I went again and was disappointed seeing it. It is no longer how it used to be. They haven’t maintained it well. It is more dry now and dirty with plastic bottles lying just like that. Visitors should also keep it clean at least! I went to Nehru zoo park recently. I was surprised seeing it. It is not like other zoos in India. It is so much better. I loved it totally. It is nicely maintained, and I could see most of the animals in good state, they all looked healthy unlike other places. It is vast and green. I also made Nehru zoo park video, there is ticket price of rs 100 for normal video camera which is not much actually. If you are making professional videos then the charge is more. This park is very nice. Go there on weekday, on weekends it is too crowded. On weekdays you can see the park nicely. It is vast so they have safaris and toy train too. we saw many animals and even spotted rare birds they have ostrich, lions, rhinos, almost every animal and birds I guess. Not just for kids, even adults will like it.